Deck the halls with bows of lipstick, fa-la-la-la-la, la la la la! Ladies, we’re about to shine brighter than a Christmas ornament, THIS JUST IN! Queen Fenty herself, Rihanna (Robyn Fenty), has just announced that on October 13th, Fenty Beauty will launch a holiday collection! #AreYouReady. 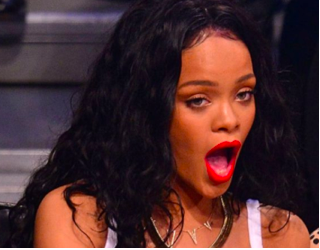 Rihanna announced the news on social media. Friday, the thirteenth? Ooh, yes Rih! Rihanna gave us a little sneak peek video with her vocals in the background and a photo of all the products which I assume are the full collection. Look below! This collection is also called, “The Galaxy Collection”. From the looks of it, the colors are very out of this world. Jupiter, be prepared to see my highlight! Scratch that, with these new colors, I will be Jupiter. 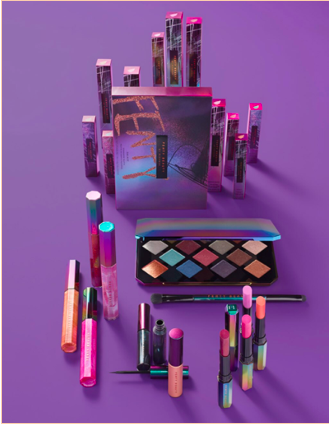 With my magnifying glass to this photo (not really), this collection is expected to bring forth an eyeshadow palette, color correctors, mascara, eyeshadow brush and lippie sticks to stunt at the holiday dinner table. Is that a liquid wing eyeliner I see at the bottom?! There are more mysteries about the collection’s products that we will all just have to wait until October 13th to find out! For now, zoom in as much as you can to get an idea of what you want.Fenty Beauty is currently on its own website, Sephora’s website and in Sephora stores only, but, let’s hope that it gets into other stores very soon because of all its success. For anyone reading this, don’t ask what I want for Christmas, because I’ll just send your question to Fenty Beauty. Sephora, keep those aisles cleared and get your best beauty consultants on the clock! We’re coming again! Stay tuned, Fenty Beauties!